AN EXPERIENCED pair of eyes will be keeping watch on the field in this year’s Liqui-Moly Bathurst 12 Hour. 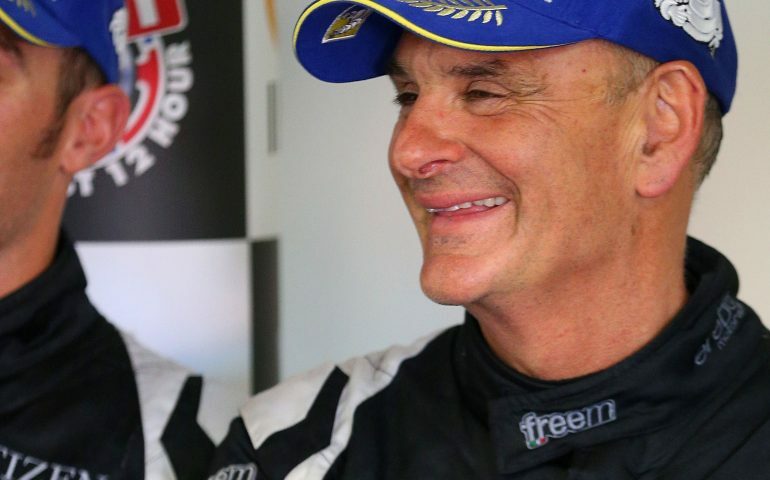 Tasmanian racing legend Greg Crick, a former Australian GT Champion, Targa Tasmania winner and 12-hour podium finisher, will take the reigns in race control this year as the event’s first ever Driving Standards Officer (DSO). The DSO works closely with the race director – this weekend experienced official James Taylor – to assess on track incidents and give the drivers perspective before any penalties are applied. Crick was arguably the star performer of the 2014 Liqui-Moly 12 Hour, when a spirited late race battle with Finnish ace Mika Salo was dubbed the ‘Launceston Car dealer versus the Ferrari F1 driver’, igniting social media at the time. Crick’s resolute defense and battle for track position would ultimately lead to the Erebus Mercedes Benz he shared with Will Davison and Jack LeBrocq finishing third outright that year. However that race would also have serious side effects to Crick’s career, carbon monoxide poisoning suffered by ingesting fumes during the race – due to damage sustained by his SLS AMG late in the race – ultimately leading to his racing retirement. “It was a big comedown for me and it was hard to accept that I couldn’t race any more,” Crick said. “I came back briefly after that 2014 race, racing with Christoper Mies, and we were leading the GT Championship. I got crashed in to in the Charger (Touring Car Masters) car and I found that some of the effects of what happened to me in 2014 had caused me some serious damage where I get concussion very easily, from a very minor impact, and that ended my racing. Crick told www.bathurst12hour.com.au that he felt he could impact the on-track product by making smart and educated calls from race control. “I haven’t been out of racing for 30 years before I started doing this and I have done a bit of racing, so I feel like I can give something back,” he said. “Even though it’s thought to be a role no one really wants, I see it differently. I think we have a fairly definite set of driving standards that we print and explain to the people so they know what they’re going to be judged by so when you have that I think it’s fairly easy to make the right decisions. “I’ve tried to define it in as simple a way as I can that my simple brain understands what I’ve written – so hopefully everyone else will understand. Having performed the same role in recent years for both the Australian GT Championship and the Australian Endurance Championship, Crick explained that his role was all about being as balanced as possible. “My whole thing is about fairness – I’ve been on the other end of the stick and I’ve been in races where you get a penalty for something you didn’t do – and there’s nothing worse. It’s all about fairness with me,” he said. Practice for the 2017 Liqui-Moly Bathurst 12 Hour commences tomorrow at 8:15am local time, with a dedicated 30-minute session for AM drivers, followed by a one-hour session for all comers at 8:50am. Live audio and timing will be available via the Liqui-Moly Bathurst 12 Hour website.